AARON RHODES is a human rights activist and an advocate for the reform of international human rights law and institutions. He was executive director of the International Helsinki Federation for Human Rights for fourteen years, and is president of the Forum for Religious Freedom–Europe. Rhodes received a B.A. from Reed College and a Ph.D. from the University of Chicago in the Committee on Social Thought. He lives with his family in Hamburg, Germany. The idea of human rights began as a call for individual freedom from tyranny, yet today it is exploited to rationalize oppression and promote collectivism. How did this happen? 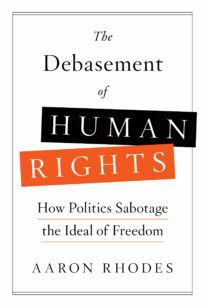 Aaron Rhodes, recognized as “one of the leading human rights activists in the world” by the University of Chicago, reveals how an emancipatory ideal became so debased.